Guys who are to propose are not the only ones who will be needing messages for this special occasion. 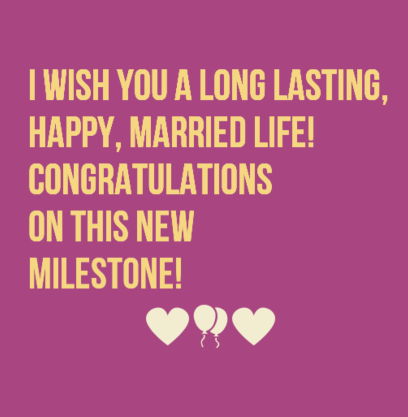 You may be the best friend, the mom, the dad, or just a friend of the bride-to-be and, of course, you will have to send her a congratulations-on-your-engagement message. It means a lot to the bride-to-be that everyone she loves celebrates with her on this very special day. Send her your warmest, most sincere, and sweetest congratulations message and make her day more meaningful. To my most favorite couple in the world, who has brought back my faith in love and inspired me to find my true love, I wish you a lifetime of happiness. Always be true to yourself, value each other’s trust. You are so lucky that you have found each other, you will never be alone forever. I am jealous but I am happy for you, guys. Stay happy and stay in love. You two are the most adorable couple I have ever met. I am really glad that, finally, you took your relationship to the next level. You deserve each other, you are meant to be, your personalities match, and though you have misunderstandings once in a while like other couples, you manage to get through it without damaging each other. 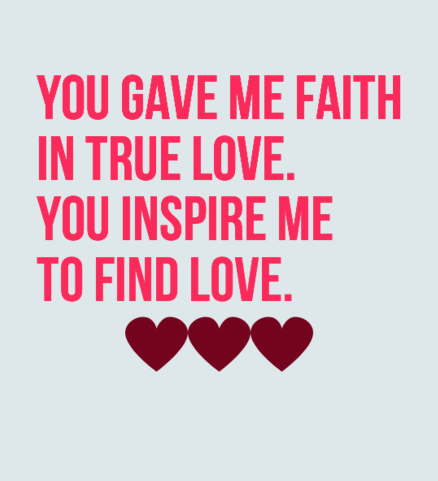 You gave me faith in true love. You inspire me to find love. In this world where people no longer believe in ‘forever’, you are two of the bravest people I know. You took the risk, you are committed to each other. 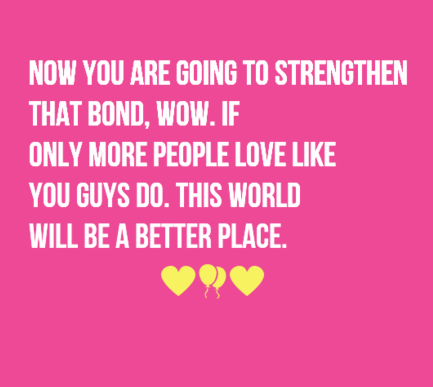 And now you are going to strengthen that bond, wow. If only more people love like you guys do. This world will be a better place. I am finally going to be a bride’s maid! I am so excited about my dress. I am so excited about the wedding planning. I am so excited about the bachelorette’s party. And of course, I am so excited to see you two struggle to manage being married to each other. Kidding! You are the best couple I know, you’ll be fine. Congratulations! Congratulations on the soon-to-be husband and wife! Marriage is not easy, it takes a lot of work and patience. But if you are with the perfect person, it won’t be that hard. Challenging, but not to the point of giving up. 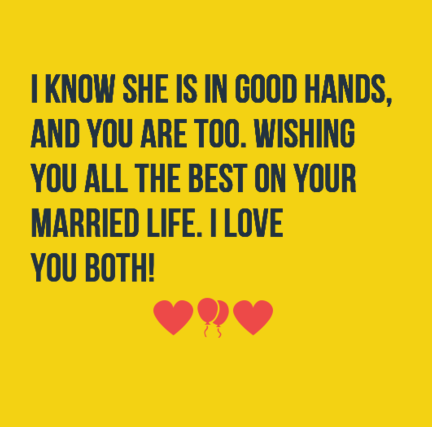 Wishing you two all the best! I can’t believe how fast time flies. 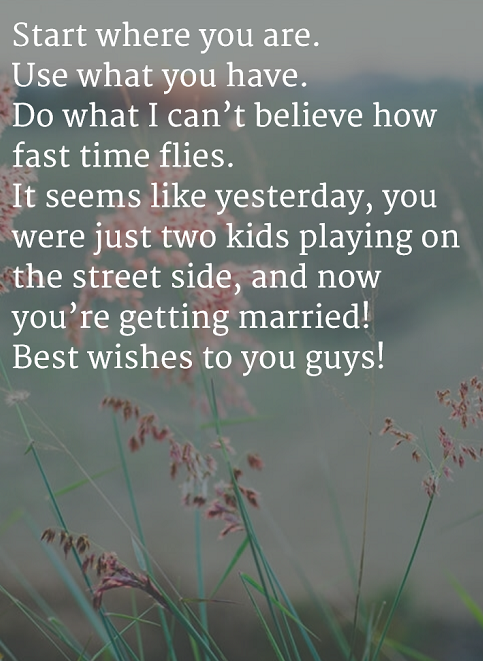 It seems like yesterday, you were just two kids playing on the street side, and now you’re getting married! Best wishes to you guys! I have taken really good care of my little girl since she was born. I never want to see her get hurt, so if you hurt her in any way, you will have to face me. But I trust you because I saw how much you love her, I saw how you take care of her and how you do everything just to make my daughter happy. I know she is in good hands, and you are too. Wishing you all the best on your married life. I love you both! I knew you would end up together! I knew it since you started dating. You two are the perfect proof that true love does not just exist in fairy tales and movies. I am so proud of you for taking your relationship to the next level. The Lord will bless you with many kids. Congratulations! You have been dreaming about this day since we were little girls. I am so happy that he made your dream proposal come true. He went up and beyond just to make you happy, I hope you know that you are blessed. He is, too. You are both adorable, kind-hearted individuals, and I am so happy that you found each other. Stay in love this way for the rest of your loves, congratulations! Who would have thought that you two, frenemies, will end up with each other? I admire you both for being the best of friends before taking your friendship to the next level. I pray to God that He will guide your relationship. Put Him in the center and no obstacle can break you. Congratulations on your engagement! This is no longer just a movie, this is true to life, this is you. Your wedding is no longer a dream, your husband to be is no longer imaginary. I am so happy that you have found the one (despite your ridiculously high standards). And I am praying that you two will live happily ever after. You are to start a new chapter in your life. It is scary, it can be bumpy, it can be exciting and fun, or it can be tiring, but in the end it is all worth it. I wish you a long lasting, happy, married life! Congratulations on this new milestone! Got surprised when I heard the news! Congratulations on your engagement. You two will enjoy the life of a husband and wife. We’ll see you at the wedding! Cheers to this couple who are brave enough to commit to each other. I pray to God that He will give you guidance, so that you can overcome whatever storm you may face on your marriage. Congratulations! 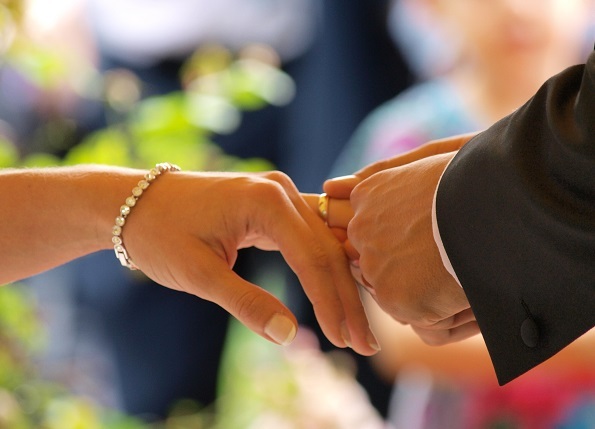 Whether you are a man, a woman, a father, a mother, a daughter, or a son, your engagement day is one of the memories you will cherish through the rest of your life. Make sure that if you are going to propose, your message encompasses all the journeys and challenges you (and your future fiancé) have been through. A genuine, straight from the heart message will surely gain your girl’s yes. You are my life, you have my heart. I want to be your future, I want to be your last. My life has never been this complete, you are all that I need. You give me the courage to move forward, and now, I am asking you to move forward with me. Will you be my life-long partner, my wife, my forever? I lived my life always afraid, people don’t know that. I am afraid of failure that’s why I did my best in everything. I am afraid to be alone, that’s why I go out a lot. I am afraid to be hurt, that is why I don’t commit. But when I met you, all that fears disappear. Suddenly, I feel so brave that I am willing to take all the risk just to be with you. I am willing to take the risk, and marry you. Now, I am asking you, will you take the risk too and marry me? My life is not an open book. I kept everything to myself because I do not want anyone else know me. I mean, there are a lot of things about me that people can’t accept. But you accept everything like it’s not a big deal. With you, I was never afraid of being myself. You brought out the part of me that I did not even know exists, you made me happy. And now, I want to make it my life’s mission to make you happy and to make your dreams come true. Will you let me be the guy, you spend your whole life with? My life is pretty much simple. I wake up, take a bath, eat, go to work, go home, eat, sleep, then repeat step one. I was contented with that routine, it’s sure, it’s safe. What more can I ask for? But then you came and made everything change. I never knew a part of me was missing until that first kiss. I could not even spend a day without hearing your voice. After all these years of being together, I still feel excited when I am about to meet you. I don’t know how you make me happy with the little things you do. When I am with you, everything feels like magic. Can you make me feel this magic every day, for the rest of our lives? Will you be my wife? I really thought I was happy, I was contented with my life. I never knew I needed someone to complete me. I was happy being alone. Then you came and made me realize, I wasn’t happy. I was just living, I was not alive. You have given me life, you are my life. Will you be with me for the rest of our lives? I spent years of searching for that perfect woman who I can be myself with. I really thought ‘perfection’ does not exist, and I almost gave up. Then you came, unexpectedly, and restored my faith in destiny. The universe gave me the most precious gift I could ever wish for. I don’t ever want to lose you, will you marry me? I want to give you your happily ever after, will you marry me? Do you believe in love at first sight? I do, because I experienced it with you. From the moment I first saw you, I had this feeling I could not explain. It was overwhelming, like my heart can’t take anymore beating because it is beating way too fast. My mind is spinning and my eyes can only see you. It is not an exaggerated version of what happened, it is the truth. I know it sounds cheesy, and this is kind of awkward for you but.. Will you stay in love with me for the rest of our lives? Marry me, please? I love the way you sing, even when you got the words wrong. I love your self-invented, out of this world recipes. I love your corny jokes. I love you and all the silly little things about you. I love you so much I don’t ever want to wake up not next to you. I love you so much, will you marry me? I am so happy for you on this special engagement occasion. May you both find total happiness together. Congrats on finding someone who you want to spend forever with, may you enjoy a wonderful engagement. A life spent with someone you truly love is a blessing and not to be taken for granted. Glad you have found the one. To many happy days and years ahead together, may love always win over all else. So happy to see you happy and I know that you are going to be very happy together. May your love see you through it all. It is great to see you so content and happy right now and I think that your love might have something to do with it. Congrats on making the move to enter that next chapter together and I hope it is the best one yet for you. Who knew that this day would come so soon, it is like it was meant to be or something. Congrats on finding your true love. To a very happy marriage together, I do not know of a better couple than you. Always put love first and you will not be let down because love endures and overcomes and helps you reach the finish line. May the years be overflowing with love and many blessings for you because you deserve it. What a blessing it is to have found that true love, here’s to a beautiful life together for you two. Some search a lifetime to find the one, I am happy for you that you have been lucky to find it now. Congrats on choosing to spend the rest of your lives together and may you have many happy years spent in love. Hoping that this engagement occasion is full of love and celebration.